These are a set of cards made for a recent Stamp-a-Stack. Gosh, we had a ball! There was even a unique bloke gracing our presence. I say, “gracing”, as he was an awesome cardmaker! His creations wowed us all. LOL! I love this set of cards. The layout for the Regal Rose, Pink Pirouette, Riding Hood Red and Lovely Lilac card worked well with the Big Birthday stamp set. The variety of cards everyone made on the night excelled all my expectations. And, the Dazzling Diamonds rivalled the sun’s sparkle. The other card was inspired by Lin Mei. Thanks for your wonderful idea, Lin Mei! I think the Kiwi Kiss/Tangerine Tango combination does solid justice to Funky Forest. And colouring in the trees with marker pens is so much fun! The best thing about this card is that everyone could tailor their cards to suit the sentiments from either Short & Sweet or Sincere Saluations. 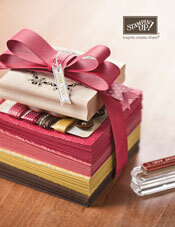 Why not book a Stamp-a-Stack class with me and make 10 cards (of 2 different designs) for only $20 (envelopes $3 extra)? That’s only $2 a card (or $2.30 including the envelope). Does the idea appeal to you? Then, what should you do? First, make sure you live not too far away from me! Then, you organise a minimum of 4 people to come around to your house and have some fun making cards. I come to you and provide everything, including a hostess gift for you. This is another card I made for a workshop make-and-take. It uses Heat & Stick powder with Dazzling Diamonds. I love the simplicity of Nursery Letters with Dazzling Diamonds on the Whisper White! The Eyelet Border punch jazzes it up together with the White Taffeta ribbon. I think these colours – Pink Pirouette and Regal Rose – make a lovely baby girl card. The sentiment from Short & Sweet finishes the card off. Do you have the Classic Stars jumbo wheel yet? If you don’t, you should! Well, I will qualify … particularly if you have kids! I think it makes great boy and girl birthday cards. Together with the coordinating star punches, it’s a must have at only $AUS15.95. This is a card I made to demonstrate heat embossing, using silver embossing powder. The SU silver embossing powder is gorgeous! You must try it. Really. You must. Together with the silver, I’ve made this card using the colours Lovely Lilac, Rose Red and Whisper White. The wide grosgrain ribbon is in coordinating Rose Red. And the lovely patterned paper under the ribbon? Well, that’s from the Sweet Nothings Simply Scrappin’ kit. The sentiment is from the stamp set Think Happy Thoughts. The little star stamped in Lovely Lilac ink is from Seasons of Joy – what a versatile stamp set! There is a neat little trick to the punched out “outlined” star. Why not sign up to receive my monthly newsletter today? Then you’ll learn the tip in my June newsletter. Extra $$ for hostesses in June/July! How long is your wish list? Would you like to cross some items off your wish list for FREE? Well, if I demonstrate a workshop where you are a hostess during June and July and your sales exceed $600 – then you earn $110 worth of FREE product! That’s right … $110! Plus a Level 1 or a Level 2 hostess stamp set!! That’s an extra $40 on top of the usual hostess benefits you receive. Fun, isn’t it?! And if you prefer – you can collect orders from the catalogue that total $600 and email me with the order, you will still receive the extra benefits as the hostess. If you’re interested in reading more details, click here. Contact me TODAY to book a date in June or July … or email me your catalogue orders over $600. Don’t miss out on the extra $$!! Tell me, what would you buy for $110?